KIT PRICE – $32 with Free Shipping USA only. ASSEMBLED PCB – $30 with Free Shipping USA only. BLANK PCB – $12 with Free Shipping USA only. ASSEMBLED and TESTED – $55.00 with Free Shipping USA only. New PCB v 7.0 is arrived. Better Quality, easy to assemble and Lead Free. 100% is safe to use! Hello everyone. 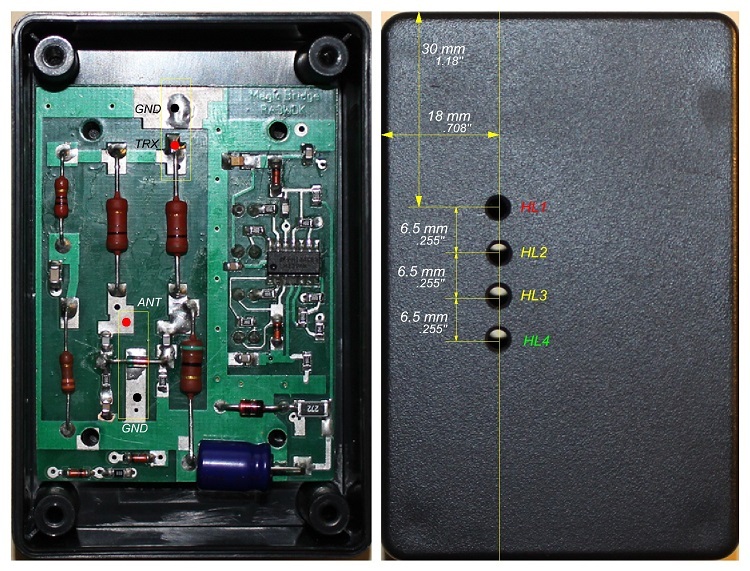 I want to introduce the new project from Ivan RA3WDK which is a Portable QRP SWR Meter. We call it a “Magic Bridge” (MB). The MB can measure SWR from 1.0 up to 4.0 and holds 10 Watts. So it’s ideal for the QRP radios like an Elecraft KX-3 or Yaesu FT-817ND. You can take it with you to the camping, hiking or expedition. It pocked sized and works without any batteries (NO external or internal DC power source) and can be used everywhere and with any QRP transceivers. The MB has a 4 color LED’s and indicates the certain SWR when transceiver is on TX. As you can see on the photo there is the two BNC connectors, one is male (to TRX side) and female (to ANT side). So, what’re the benefits of this particular SWR meter? Sounds good, doesn’t? Let’s see what we have inside in that “magic” black box. As you can see there is only one small PCB with the SMD components and a couple film metal resistors. You’ll be surprised but the board hasn’t special or expensive components. 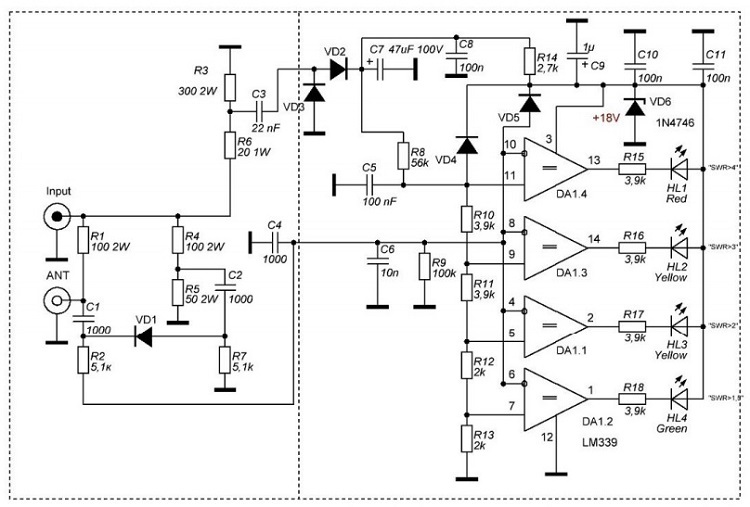 Basically it’s the simple RF bridge and voltage comparator. Let’s take a look the schematic diagram of our “Magic Bridge”. 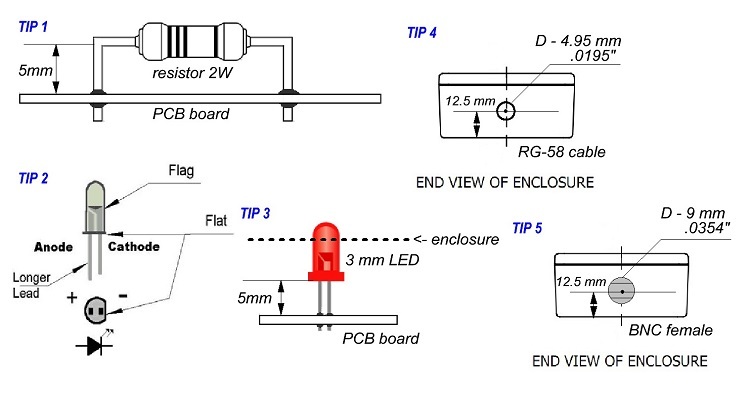 You can download the schematic diagram and part list as a PDF file here. It’s really easy to assemble and will take just an hour of you time. No tuning required after assembling it’s should work without any issues. I’ll give to you advise how to assemble, test and use. We’re offering to you a kit which is an enclosure, blank PCB board, all components, two BNC connectors with a cable and hardware screws. That’s all that you need. The price for the basic kit is $29.99. The “Magic Bridge” comes only with BNC connectors and holes are nor drilled. You can use the drilling template. The first, we have to solder all SMD components and then the through hole components. Now the through hole components. The resistors all through hole resistors should be mounted 1 or 2 mm above the PCB. Don’t forget they will be hot during operation. You also can download the assembly instruction from Howard W1ZKK. Thanks Howard! Now let’s check all components and soldered points. I recommend to use a NON clean flux but anyway after soldering please clean the board. Here is some tips about the components. Check again. This is how the board should look with the all installed components. After that our board is ready to use and now it’s time to get ready the case (enclosure). We have to drill the 4 hole for LED’s and other 2 for the cable and connector. Please use this template to drill a holes. Diameter of all holes for the LED’s is 3 mm. 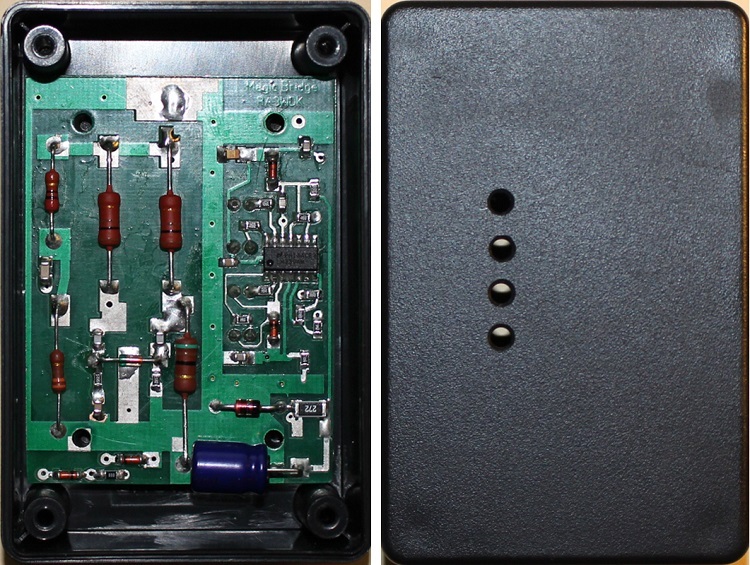 Here is a datasheet for the 1591XXM enclosure. The holes for the RG-58(.195″ or 4.95 mm) and BNC connector depends on your uses and can be not centered. When you finish drilling please verify that all holes are correct and have a right diameter. If they’re fine now the next step is put the board and screw it down. Now we have to solder a cable with the male BNC connector and single female BNC to the board. Look on photo. As you can see for the female BNC I used a short solid wire (20 AWG) between the pin and PCB. Also use a same wire for the ground connection. Please check again all connections and PCB board with the components as well. Now is time to test our SWR meter. The first, set the output power of TRX to 1 or 2 Watts. 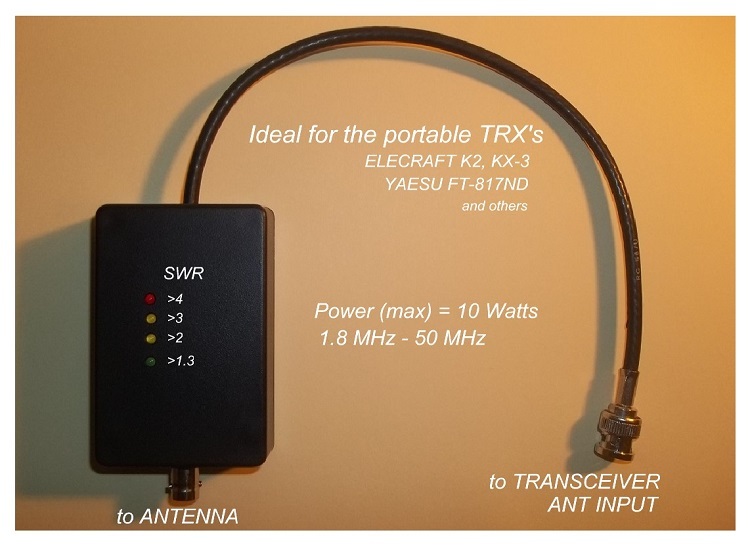 Connect the SWR meter to the TRX and leave open the ANT input. Select a CW mode and press the key or set to FM mode and press PTT. All LEDs (red, two yellow and green) should light. Perfect. Release the key or PTT. Now hook up the 50 Ohms resistor to the ANT input of the SWR meter and repeat the previews procedure. Should be NO light. This is equivalent to the SWR 1.0. Great, everything is work!!! My congratulations! If you have a couple more resistors (25, 75, 100, 150, 300 Ohms) and free time you can try to do more experiments to find out the right SWR measurements. Here is a table, look at it. Questions? Worked fine? Since that our SWR meter is ready to use. If the “MB” didn’t worked don’t give up, we’ll try to find the problem and fix it. Let’s start a troubleshooting. Check this out. Here is a voltage diagram. To check the voltage in those points you need to hook up the “MB” to the transceiver, set the output power to 2-5 Wstts and push the PTT (in AM or FM mode on any HF bands), another words we have to transmit the RF signal. Take the multimeter and check a voltage in all points. That’s it, if there still no voltage, please check the circuit, diodes and LM339 (could be you soldered them backwards). That is the most typical issue. There is no more possible issues. The circuit it’s easy and should work if all components were soldered properly. Don’t forget – DO NOT EXCEED POWER MORE THAN 10 Watts. Our technical support is 24/7. KIT PRICE IS – $29.99 with free shipping USA only. International customers please contact me before buying. You can buy it on eBay in my store. Magic Bridge ? Delivery time ? The price is $50 for assembled and tested with free shipping CONUS. Delivery time is 1 week. Thanks. I would like to purchase an assembled and tested unit for the price you quoted $50. I use pay-pal. Let me know the next step…. I’ll make one for you as soon as possible and start work on it today. You can find my email on qrz.com, I use the same for the paypal. In the comments please put “Payment for the Magic Bridge”. Thanks. Don’t see why four LED’s are necessary when one will do the job. Don’t see why not four. Each represents the value of SWR. The Portable QRP SWR Meter. Саша питания без Интересно, как это работает. Привет Амиран. Очень просто работает. Посмотри на схему – ВЧ напряжение детектируется и выпрямляется тем самым питает устройство. Thanks John for a your review. 73! 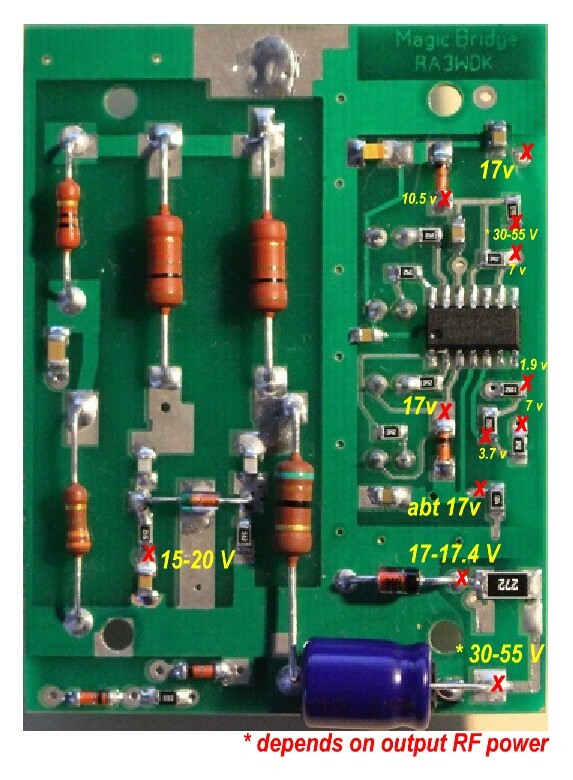 I have a 40m Rockmite transceiver that is rated at less than a watt. 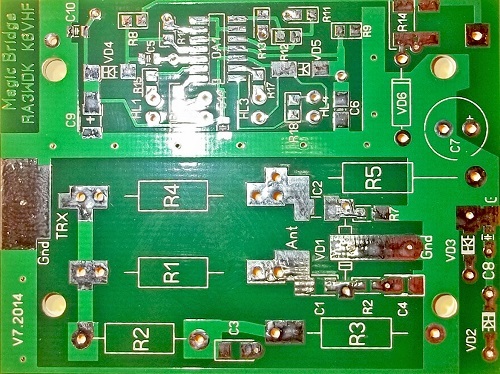 Would your magic bridge work with that low power of a rig? The lowest power that needs to feed this device is 1 W. With 1 W I guarantee 100% functionality of the Magic Bridge. Hello Rogers. Thanks for your interest. Unfortunately the kits are out of stock. I’ll let you know when. Could you please update me on this kit as we’ll? This is the best go-box tool on the market! Ok, you are in the list. Thanks. Any update on Magic Bridge kit availability? I have one assembled unit available for sale if you interesting to buy it. The kits are still not available. Thanks. I’m new to all this. With a Yaesu 817nd, how would this work in the higher freq’s? Thanks! As I mentioned free shipping only to USA. International buyers must pay actual shipping cost to their country. Package weight is 6 oz. Thanks. What is the frequency range for this? Frequency range is : 1.8 MHz up to 50 MHz with maximum power of 25 Watts. From circuit diagram, I assume once your antenna matcher is tuned for minimum VSWR, you must disconnct the Magic Box from circuit or you will have a loss from the series resistor in the bridge, unless there is a bypass switch to take out the resistor in the signal path? Absolutely correct. You can work thru SWR meter but you have to consider about 25-30% of power losses. The best solution would be use a bypass switch. 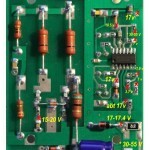 Would like to purchase qrp SWR kit. I live in Scotland and would pay via Paypal. Are you willing to post this to my relative’s US address in Annapolis MD. They will be coming across the pond soon. What is your delivery timescale? How do I give you their address? 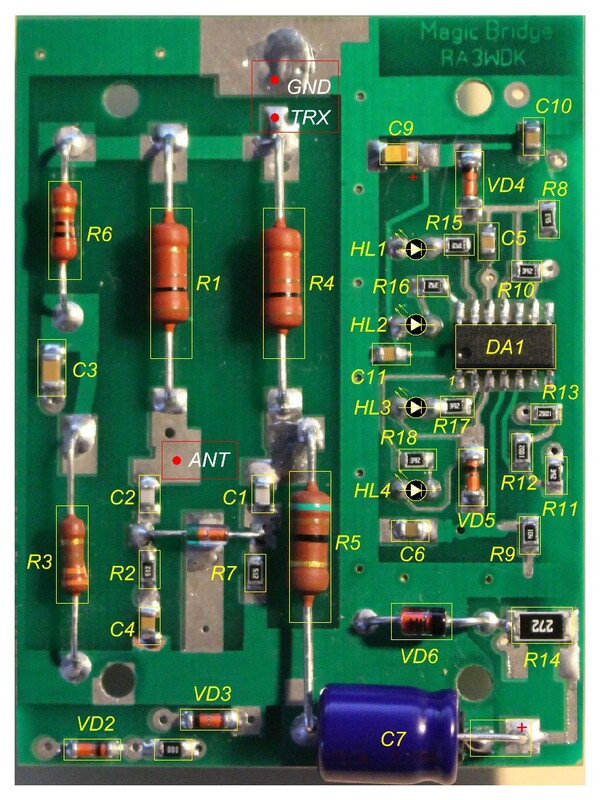 Concerning a bypass switch to compensate the power loss, is it OK to place the switch parallel to the series resistor R1 or would it be better to place the switch before the TRX entry, so that the whole circuit is not disrupted and sees no RF? 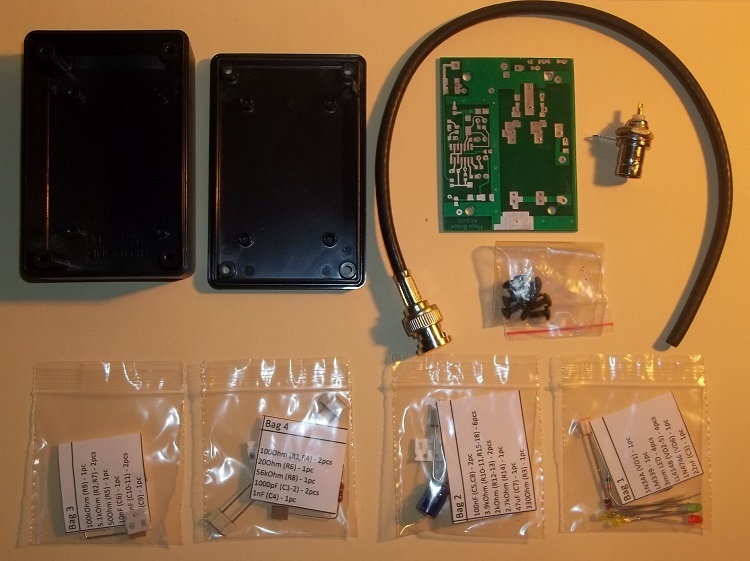 loop antennas, Alex Loop,Alpha Loop,Chameleon Loop and some portable wire antennas.Have you thought of putting your “Magic Bridge” in a QRP tuner with a in / out switch ? Tnx again for a great product! “The uploaded file exceeds the hosting plan limit. Please, consider upgrading to a more powerful hosting package. When you donwload it and open it. Can you provide an active link. Maybe use google Drive. any plans to make one for 2m and 70cm? or something like the spark 100 and have an android hookup? seems a nice addon to my tentec 1340. Is this product still available ? 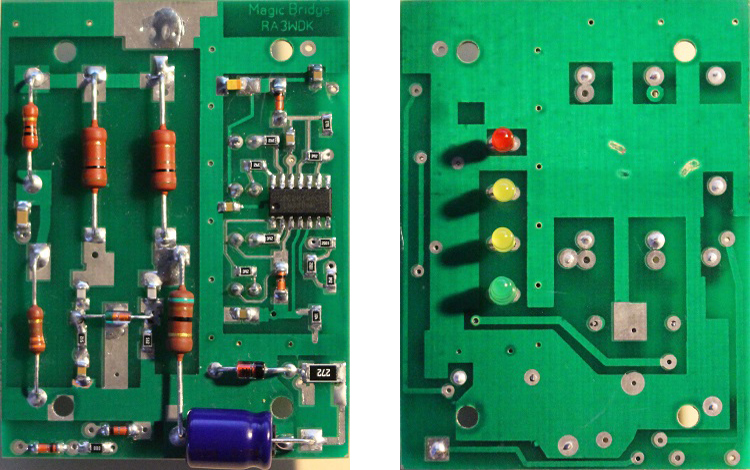 Would be interested in the kit version or just the pcb kit (pcb + components, without enclosure and connectors). Shipping to switzerland possible ? Yes, I can send to you just a kit without enclosure. what is the frequency range for this meter? Is your magic bridge device still available for purchase? I’d be in for an assembled one if so. Can you please tell me the weight of the assembled meter? Are you still making these units? Just getting back into HR and it looks very handy! Hi. Unfortunately, I stopped manufacturing them.